My St.Bernard - "Od Mikija"
Handsome brode you have there! "My best friends is st.Bernard!" 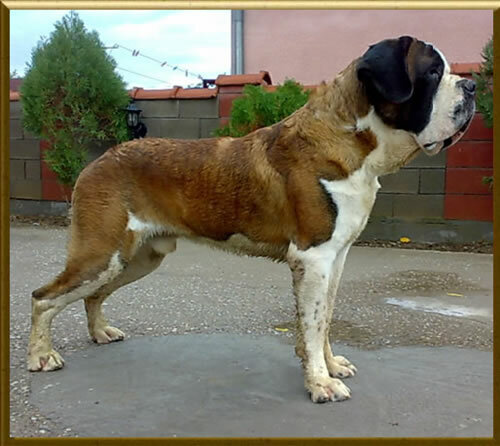 NEW MALE IN OUR Kennel st.bernard "od mikija"
Your Zenzi is so beautiful. Hi there, Yes I really like Zenzi also. Thank you all for the praise for our dogs and lots of greetings from Zenzi and kennel "od mikija"
that, as you would not recognize you'll be super grow in a very large St. Bernard, here are a few pictures while you were here with 4 weeks and 8 weeks of age! I have those thanks I will send you some more by email in a couple of days he is very very big now almost the size of a 6 month old if not bigger lol. I think he needs a new name of 'Beast od Mikija' hehehe. Miki, do you have pictures of Bruton's brother and sister ? we are curious as to how they look like now. Da li imate slike Brutonovog brata i sestre? Radoznali smo da vidimo kako izgledaju sada. Subject: Re: My St.Bernard - "Od Mikija"